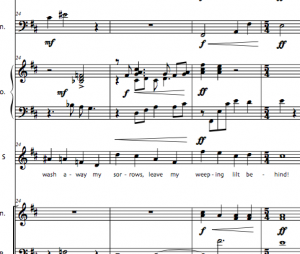 This song cycle is part of a larger set of songs that address issues of working poor. Although the US remains the richest country in the world, over 43 million Americans live in poverty, and over 100 million live in “near poverty.” While unemployment is low, most jobs for the working poor do not provide the proper health insurance, and Americans often have to take up more than one job to make ends meet. Both cities and rural areas have been ravaged by the departure of industry, and 2017 saw a peak in opioid overdose deaths. The United States also has the largest prison population in the world, more than Russia or China. I wrote the lyrics, many of which were inspired by personal life experiences from my career as a math teacher. I’ve taught in a male prison, as well as K-12 schools in Baltimore City, New York City, and Virginia. For a decade I learned stories of children from underprivileged families. My own childhood experiences of being poor also influences my lyrics. Songs of the Working Poor borrows ideas from a number of musical genres to give these sinister texts an ironic flavor. Although many of the songs sound North American, I’ve also incorporated sounds of Caribbean music, European music, and classical music. Given the rise of political and economic instability across the world, I wanted to make the music eclectic. I have completed six songs so far, three for soprano, and three for tenor. 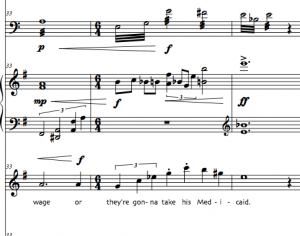 The second set, for tenor, piano, and double bass, addresses mass incarceration. “Anger” explores the toxicity of rage, and how it inhibits judgement. “The Food Chain” compares animal behavior to human behavior: in prison, you learn lessons such as playing dead, going for the low hanging fruit, and relying on group loyalty. The final song, “Three Cents an Hour,” is sung by a prison inmate whose relationship with his daughter has deteriorated. It alludes to an ever growing practice of slave labor in the US: the only way the inmate is allowed to talk to his daughter is by working for an entire month at three cents an hour. 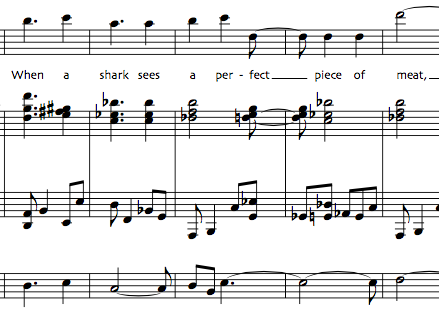 “Three Cents an Hour” and “Anger” are both completely tonal, but “The Food Chain” is written in a twelve-tone style. 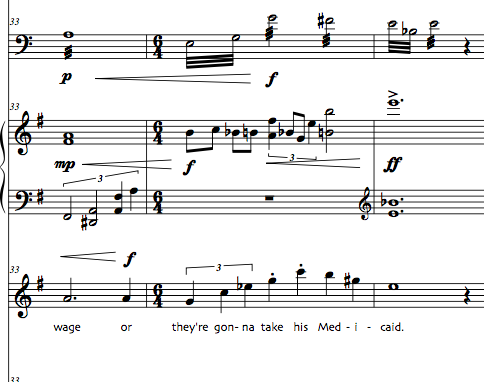 I hope to write up to twenty Songs of the Working Poor, including some for alto, mezzo soprano, and bass. 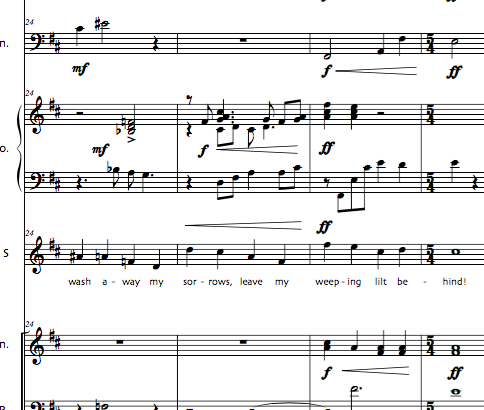 I’m happy to transpose or make small revisions to the songs (both the vocal parts and the instrumental forces) to accommodate a more successful performance. 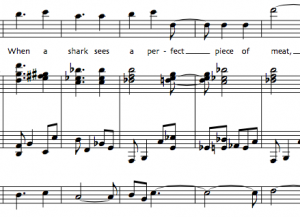 These songs can be performed individually, or as a set. If you’d like to view the score, or listen to a MIDI realization, please feel free to reach out to me at thetruebadour@gmail.com. I feel a certain closeness to the music when I’m putting pencil to paper. I carry around my sketches wherever I go, and use highlighters and colored pencils to cross out passages I don’t like and write new ones over it. When I witnessed composers like Michael Hersch and Kirk Nurock present performers with handwritten scores, I also noticed a collaborative rapport. It was almost like they were delivering something very personalized to a good friend. Normally I use Finale to engrave my final product– especially if I don’t know the musicians’ preferences. But once in a while I’ll find a musician like Peter Sheppard-Skaerved, who embraces handwritten music. About half of this piece was written on a train from New Orleans to Baltimore. I also wrote part of Lake Pontchartrain on this ride. When I Have Fears, ruminates on John Keats’ sonnet and the existential issues it presents. It features Keatsian imagery such as bird songs and slow, sarabande-like rhythms. This recording features vocalist Rahzé Cheatham, with Nell Flanders conducting. The orchestra is comprised of Peabody musicians. The instrumentation is 2 flutes, 2 oboes, 2 clarinets, 2 bassoons, 2 horns, 2 trumpets, 2 trombones, a timpani, and strings. Like a marathon runner, Endurance maintains the same, steady metronome marking throughout, though its gestures alternate between careful, steady movement, and unpredictable rage. The syncopation of the opening notes provides a foreboding backbeat, returning throughout the piece in various registers and instruments. Like some of his other pieces, the music’s emotional content is inspired by grief and soul searching, alluding to what humanity must endure in today’s turbulent times. The work draws from jazz and microtonality, among other influences. Water is emotion, and every body of water I visit makes me feel a different way. Lake Pontchartrain is a shallow estuary in Louisiana just wide enough that one cannot see the other side. To get to New Orleans, one must travel across its waters on a freeway or train elevated just above the surface. On a cloudy, rainy day, the gray waters of Lake Pontchartrain evokes feelings of sadness, serenity, intimacy, and longing. 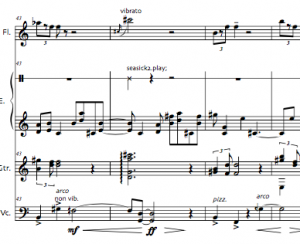 The piece begins and ends like the lake’s gentle, unending waves: instruments play long single notes at different times, creating a chord progression that sways between dissonant clusters and tonal harmonies. The quiet middle sections are inspired by nature: wind rustling, birds chirping, and stillness. It features sparse triadic gestures, microtones, and cellos bowing on the bridge.